What did you like about the book? 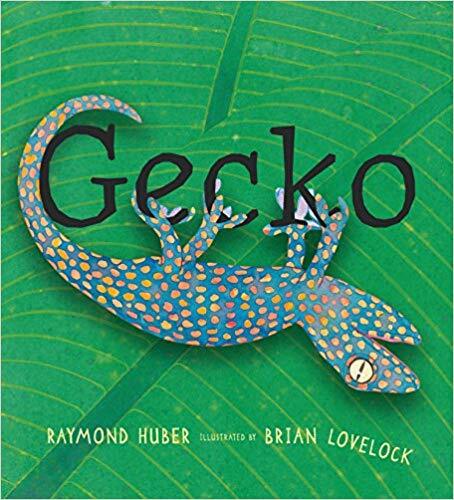 Absolutely stunning artwork combines facts about geckos with an exciting story about a day in the life of one little reptile. Bold, realistic watercolor and ink paintings follow Gecko as he wakes up, finds food, escapes predators and protects his territory. I loved the combination of the slightly gross (he eats his own tail after it comes off in a scuffle!) with the mundane (his diet, senses, physiology…) Two different fonts make it easy to distinguish between story and science content and an index sends readers back to find information about keywords (predators, camouflage, cold-blooded, for example.) Huber carefully constructs the narrative so that answers emerge organically from the text just as they start to nag at the reader. The cover art is especially eye-popping, with Gecko hanging upside down from the title. Anything you didn’t like about it? No. It’s absolutely perfect. Who should buy this book? Elementary and public libraries. This entry was posted in *Starred Review, Book Review and tagged Candlewick Press. Bookmark the permalink.